Praveen Siddannavar's Blog: Up Close and Dangerous! Tiger Census was conducted during the 4th week of Jan’10 for about 7 days across all forests in Karnataka state. The forest dept sought help from general public and wildlife enthusiasts to volunteer for this good cause. The highest number of applications received was from none other than from our own IT professionals from Bangalore, unfortunately due to work pressure I missed out on this opportunity. The results of Bandipur were promising ~ 120 Tigers or more exist in this forest, these are unofficial results however official numbers will be announced soon. This tempted me to visit Bandipur over the weekend. As usual I got ready for the jeep safari at 3:45pm. Being a regular visitor to JLR, Bandipur most of the time I prefer to be in Kiran’s jeep - driver though, I consider Kiran as a Naturalist simply because of his in-depth knowledge about the forest, behavior of animals, core areas and movements of the wild cats. However even Natraj joined us in the same jeep, he is a Naturalist and good guide for trekking. It was a hot afternoon we drove towards the anti-poaching camp, as we reached there it was almost 4:30pm. A forest guard came out of the camp base, we asked him, if he has sighted anything, he replied that he saw a tiger at 4:10pm on Subramanya Katte road resting underneath a tree. We started heading towards that direction but did not see any tiger there, we drove a little further and saw pug marks (foot prints) but the pug marks were visible only for few yards. Later we reached a water hole known as Ane katte where 2 jeeps were already there & they were watching a Elephant herd. Time was running out, I told Kiran to check all the water holes, normally once a day tigers come to quench their thirst. By now we had spotted a mother and Calf Elephant, Malabar Giant Squirrel, Chital & Sambars. Our search for tiger continued we were about to reach a water hole called KM katte, that is a highly dense and covered with lot of bamboo. The time was almost 6pm and the light was fading fast, as we reached KM Katte, Kiran noticed a tiger drinking water through the bushes on our right, by now ours was the only jeep at this location. I asked Kiran to stop the jeep at the best possible angle, I was sitting next to him, I partly opened the door and rested my camera/lens on roof top of the jeep, due to low light I was unable to click, in Digital SLR’s if light is low your shutter speed goes down drastically and the images get blurred. To make things worse the water hole as mentioned is densely covered with bamboo so it was even more difficult to get a better view of the tiger, I saw the time & it was 6:10pm. 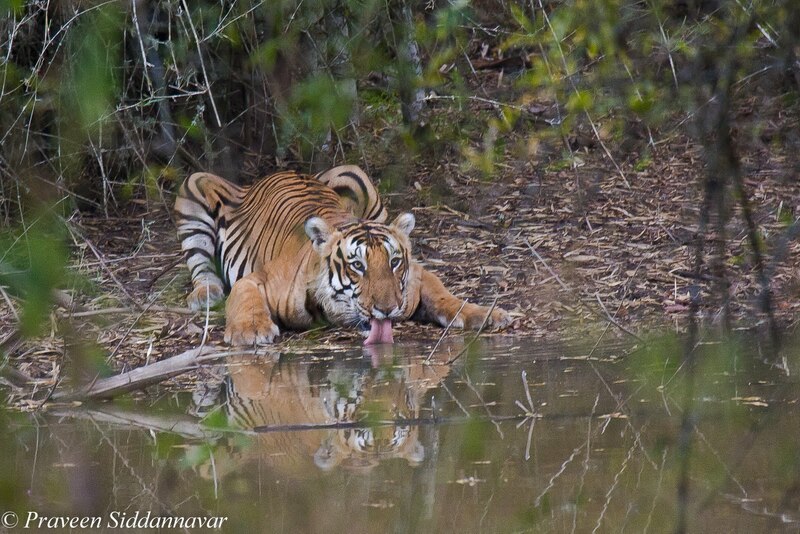 I didn’t want to miss this golden opportunity to photograph a tiger quenching its thirst. I quickly changed my setting of my camera and increased the ISO to 1600; fortunately the tiger was still there. I had set my camera to burst mode & clicked my shots, with this mode the camera makes typical sound like as if someone is firing bullets. 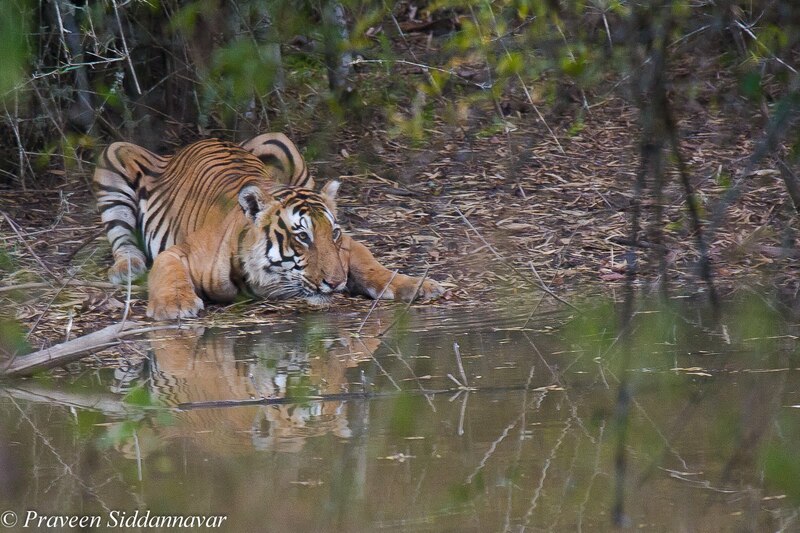 Upon hearing the sound the Tiger stared at me & simultaneously was drinking water. Wow! What a Beauty! I have done it! I kept saying to myself and continued to click. 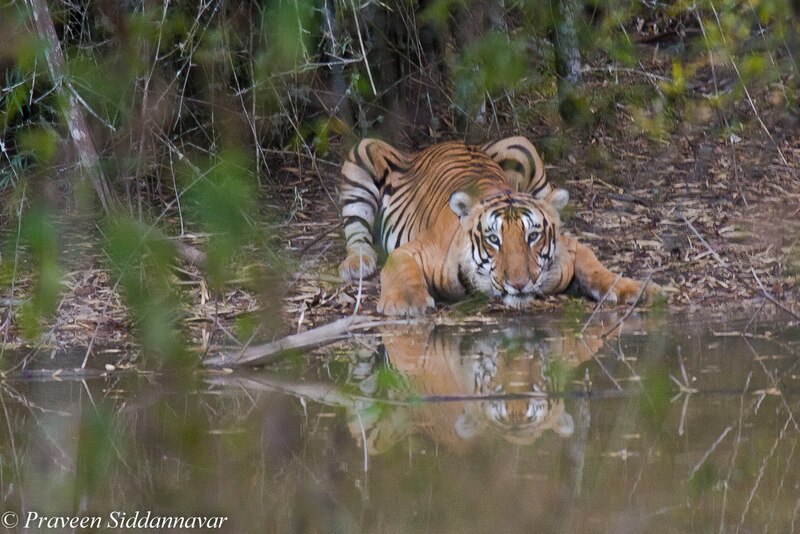 I have never ever seen a tiger in this pose or posture before, just a foot above ground level. It can go unnoticed so easily especially in dense areas like this one; this was surely something different and a very special moment for me. Since the tiger disappeared in the under growth we thought it may come on the road so we drove a little ahead near Yere katte and waited for 5-10 mins but he did not come. 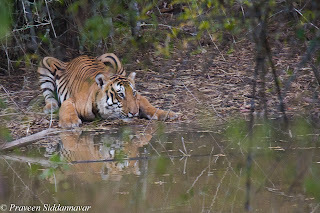 So Kiran said lets go back to the water hole that KM Katte & check, to our surprise we saw 2 jeeps watching the same tiger drinking water, probably he was so thirsty that he returned to quench his thirst. Now we could only see him with our naked eye, due to very low light there was no chance to photograph; it was past 6:30pm. Upon reaching the resort the guests from other jeeps wanted to know if anyone managed to take pictures of the tiger drinking water but none of them could get a single image. Upon seeing my images all of them were amazed to see such a handsome male & with some extra-ordinary posture of drinking water.